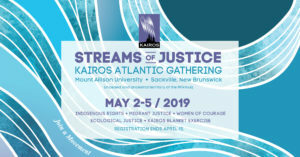 Streams of Justice, the KAIROS Atlantic Gathering for 2019 will be held at Mount Allison University in Sackville, New Brunswick on the unceded and ancestral territory of the Mi’kmaq. Centrally located in the Atlantic region, Mount Allison is a half-hour drive from the Moncton airport. Shuttle service will be available from the airport to the Gathering. 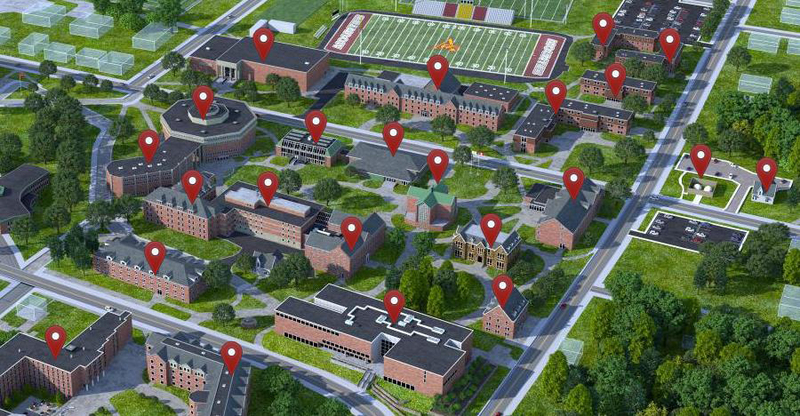 Mount Allison proudly boasts a compact pedestrian-only campus, where one can walk from one corner to the next in about 10 minutes. Plenty of free parking is available on the outskirts of campus. We encourage carpooling or low-impact public transportation (ground rather than air) where possible to keep our carbon footprint low. Check out the Facebook event and post a comment to organize carpooling. If you need to fly the closest airport is Moncton at just 30 minutes away; next is Halifax at just 2 hours drive away. KAIROS will provide a shuttle service from the Moncton airport on Thursday and Sunday. Via Rail offers a daily train service both ways between Halifax & Sackville.